Germany, and 6% in the USA. disorder affects over 13% of children in Germany. than .5%). In Germany, 11% of children suffer from this problem. * Less than 1% of unvaccinated children had experienced sinusitis. This compares with over 32% of children in Germany. suffer this neurological illness and 1 in every 38 boys in the UK. the results are starting to be published. Hep B jab before being taken home. those by the age of 6 months)! vaccines for health clinics in the United States alone. never be reported objectively on the evening news or in major newspapers. vaccination has only gained steam in the past 5 years or so. remedies to allopathic (drugs/surgery) methods for illness intervention. not to vaccinate for that reason. both in the short and long term should you forgo immunization. Still have questions? See all my posts on vaccination by clicking here. To view the entire survey results, click here. Bifidobacterium lactis Dr. Usman pointed out in her AutismOne speech that it promotes neurogenesis--new cell growth in the brain. Supports digestion, helps prevent and stop diarrhea and improves immune function. Lactobacillus acidophilus produces lactic acid (which inhibits yeast growth) as well as natural antibiotics, and has been shown to inhibit the growth of pathogenic bacteria such as salmonella, shigella, S. faecalis and E. coli. Studies have shown that L. acidophilus is effective in reducing lactose intolerance and reinforcing the immune system, as well as reducing cholesterol levels. Lactobacillus brevis is a transient bacterium that is valued for its ability to help improve the symptoms of lactose intolerance. L. brevis inhibits the growth of some pathogens, and its proven antimicrobial effects support the immune system. Lactobacillus bulgaricus is a transient strain that produces interferon, a protein that inhibits the replication of invading viruses, on its way through the intestinal tract. This bacterium is beneficial in cases of acute diarrhea and lactose sensitivity. Traditionally, L. bulgaricus is found in yogurt along with S. thermophilus. Note: Has been proven to produce histamine, so avoid if needed. Lactobacillus casei is commonly used for milk fermentation and is naturally occurring in the mouth and digestive tract. It breaks down carbohydrates and inhibits the growth of pathogenic bacteria in the small intestine. Studies have demonstrated L. casei's antimicrobial effects and its helpfulness in treating diarrhea caused by antibiotics and viruses. Note: Has been proven to produce histamine, so avoid if needed. Lactobacillus plantarum secretes a naturally occurring antibiotic called lactolin, giving it beneficial antimicrobial activities. This probiotic is being studied for its efficacy against allergies. It also breaks down histamine. Lactobacillus rhamnosus occurs from the mouth to the small intestine, and helps inhibit the pathogenic bacteria involved in vaginal and urinary tract infections. It produces a mucus coating called mucin, which prevents toxins from entering the bloodstream and protects against the invasion of harmful microbes. L. rhamnosus has been shown to enhance the effectiveness of oral vaccinations against rotaviruses (which cause vomiting and diarrhea) and may help to remedy gastroenteritis (also called "stomach flu"). Shown to down regulate histamine receptors and up-regulate anti-inflammatory agents. Lactobacillus salivarius found in the mouth and small intestine, has been shown to improve bleeding gums, tooth decay, bad breath, thrush and canker sores. L. salivarius breaks down proteins and produces B vitamins, enzymes and lactic acid. Its strong antimicrobial effects have been demonstrated clinically. Bifidobacterium bifidum assists with proper digestion and absorption of calcium, iron, magnesium and other vitamins and minerals. It manufactures B vitamins and produces lactic and acetic acids, which inhibit the growth of unfriendly bacteria. Studies have shown that B. bifidum can reduce the incidence of acute diarrhea in infants and is beneficial in the treatment of inflammatory bowel disease. With regular use, B. bifidum can improve immunological and inflammatory responses in seniors. Bifidobacterium breve also produces beneficial lactic and acetic acids. It has been shown to repress the growth of ulcer-inducing bacteria. Recent studies have demonstrated that B. breve populates the immature bowel of infants and can help very low birth weight babies to gain weight. Bifidobacterium infantis is the most important probiotic found in infants' colons and is effective in the treatment of acute diarrhea. It stimulates the production of immuno-modulating agents, and can fight such pathogens as clostridia, salmonella, and shigella. It also breaks down histamine. Bifidobacterium longum plays a direct role in preventing invasion of pathogenic and putrefactive bacteria. B. longum breaks down bile salts, helps to synthesize B vitamins, and stimulates the immune system through its effects on immunoglobulin A (IgA). Another producer of the good acids (lactic and acetic), B. longum has been clinically shown to improve lactose digestion and constipation. It also breaks down histamine. Lactobacillus lactis (also referred to as Streptococcus lactis) is another transient bacterium that produces the immuno-supportive lactic acid. Lc. lactis produces a peptide called nisin, which has proven activity against C. difficile. In addition to controlling acute diarrhea, it is also recognized for its potential in the long-term management of colitis. Lactobacillus gasseri is in some of Garden of Life's probiotics. These bacteria are thought to help the body function properly by reducing harmful bacteria, enhancing immune function, and stimulating digestion. It is often used to promote weight loss, reduce belly fat, inhibit fat production, speed up metabolism and protect against obesity. It is said to treat allergies, asthma, diarrhea, high cholesterol, menstrual pain. Lactobacillus reuteri Note: Has been proven to produce histamine, so avoid if needed. Saccharomyces boulardii, is an important yeast that functions like a probiotic in the body. Doctors have recommended it to help patients with diarrhea. It helps to regulate the intestines and protect them from pathogens and other things that can damage the intestinal lining. It also modulates different parts of your immune system and keeps the intestinal barrier function up and running. Studies show that taking S. boulardii alongside your antibiotics can reduce the possibility of getting diarrhea. S. boulardii can also help treat other ailments such as lactose intolerance, and might even have a future in the treatment of acne, vaginal yeast infections, high cholesterol, fever blisters and canker sores. It seems to improve the quality of life of people with irritable bowel syndrome (IBS), as well as Crohn's disease. According to Dr. Sid Baker, "For some individuals on the autism spectrum, the combination of S. b., a yeast-free diet, and avoidance of refined carbohydrates is all it takes to produce a dramatic improvement." Jett has ASD and takes 2 a day. For recommended probiotics, also see the DS Day to Day amazon Store. You want to look for a good delivery system and one with Bifidobacterium lactis and without Streptococcus thermophilus. A high potency probiotic powder containing 5 probiotic strains of human origin and 2 prebiotics in an acid-proof, controlled-release formulation. Has Bifidobacterium lactis and 4 other strains. What's the best first shoe for your baby? Well, going barefoot is best since it provides the best grip, and therefore stability, on the floor as well as tactile stimulation while walking, but it's not always practical or socially acceptable. 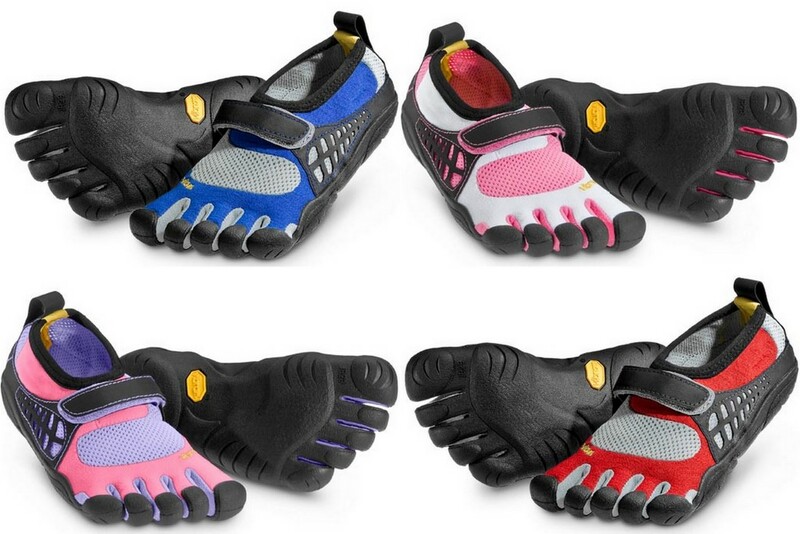 So you want to find the shoe that mimics bare feet as closely as possible. For Jett, I bought the Robeez brand baby shoe. They are 100% leather so his feet can breathe and his toes can move around and grip onto the floor. The soles are thin enough that he can feel the differences on surfaces. But they also protect his feet from ant bites, abrasions from shuffling on the floor and from sharp objects. I plan on continue using this style of shoe as long as he can fit into them, even once he can walk. Here's a collection of ads and links for a variety of baby shoes that support this same concept. I got Jett's used from a friend through a forum who snatches up any Robeez she sees at garage sales. If you've tried any of these shoes, or similar, please share your experience! Robeez footwear flex and bend with every step. 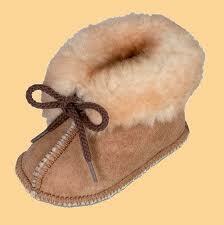 They promote good balance and unrestricted growth, while protecting little feet from the world. They stay on too, with elasticized ankles to ensure a perfectly snug fit. Prices range from $20 to 48. Ebay sells them new and used. Adorable shoes! 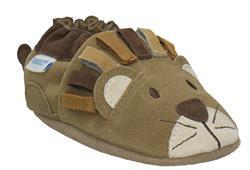 I got Jett's all to look like "real" shoes instead of the cute little themed shoes like the lion on the left. Bobux designs face your baby! After all they are the ones wearing them, shouldn't they have the best view of the cool designs. 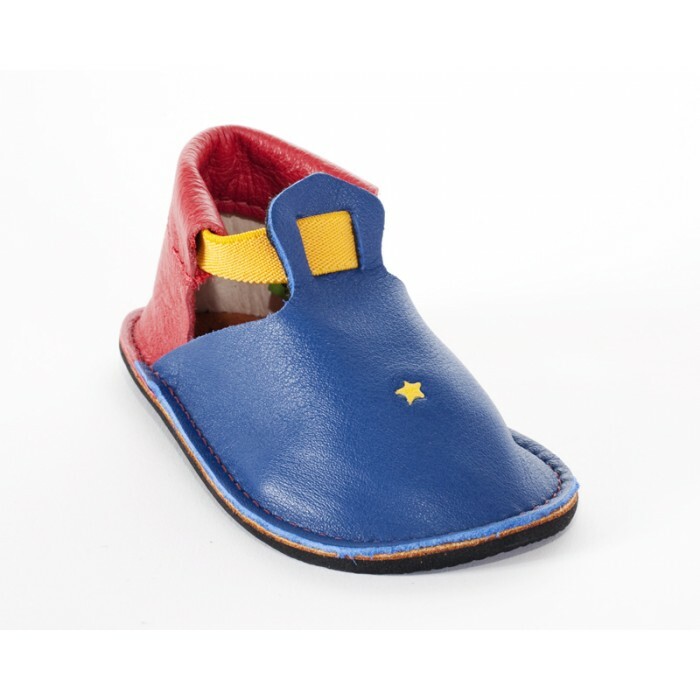 Bobux are recommended by Pediatricians as the perfect footwear for children under two. The soft leather upper and suede leather sole allow the feet to function properly and grow without restrictions. pediped Originals® are the first step in the pediped® footwear system and the best first shoes your child will ever wear. When children learn to walk, they tend to shuffle, so it is important for their feet to feel the floor. Doctors recommend shoes with soft leather soles because they most closely mimic barefoot walking and do not force children to change their natural stride. Priced around $32. At Soft Star, we believe shoes should provide protection from the elements while doing the best to simulate barefoot conditions. 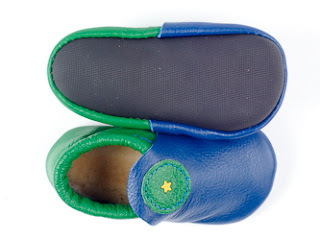 Soft Star Shoes are designed wider, with flexible soft soles and natural breathable materials. All our soles are as lightweight and flexible as possible while still providing the protection needed. For children in particular, this is important as the bones in their feet are still forming and not fully ossified until ages 9-11. Many children's shoes made today are simply scaled down versions of adult shoes with molded arch supports, stiff soles and foot beds that are too narrow to allow toes room to spread. The Sof-TouchTM sole is low profile and non-skid to minimize trips when little ones are getting the hang of walking and running. These soles are durable and provide plenty of protection from outdoor elements. 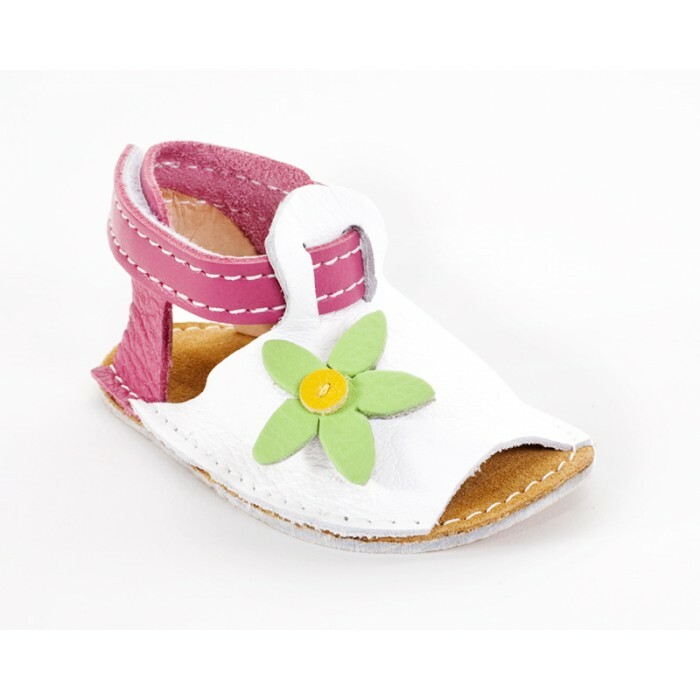 The Sof-TouchTM sole makes a very nice first shoe for your toddler and is used on shoe sizes 3 to 7. Our classic VibramTM sole is lightweight and flexible, but tough enough to handle anything you can dish out. Vibram provides light cushioning while still giving a barefoot-like feel. It has a flat sole (no arch supports!) which will mold to the shape of your foot over time. The Vibram sole is used on shoe sizes 8 and up for children, and on the Rambler style for youth and adults. 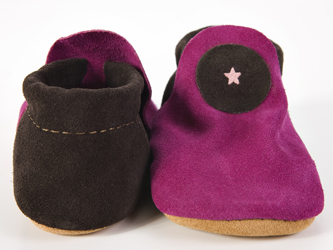 Our moccasins start with a sheepskin fleece inner sole that works as a cozy cushion and naturally wicks away moisture. The wicking action keeps feet cool in the summer and warm in the winter. We then add an outer sole, of which there are several options. Our traditional suede sole is flexible and soft. Suede is naturally durable and non-skid. This sole works well both indoors and outdoors with a thick suede for protection. More than one baby has made their first steps on this terrific sole. For adults looking for a minimal shoe - this sole gives you the best "barefoot" experience possible allowing your feet to move naturally as if they were inside a leather sock.Note: After extended wear, you may want to 'rough up' the surface with a wire brush to maintain non-skid properties. The T-rex sole is a non-slip rubberized fabric bonded to the suede sole above. T-rex is made with the same material used by mountain climbers to provide extra gripping on their gloves. As well, the black soles maintain a clean appearance even after a lot of wear. The rubberized fabric adds a moisture barrier keeping feet a little drier when you walk across a wet sidewalk. This is not a rubber sole - but a rubberized layer for non-slip purposes. Over time you may wear through the thin rubber layer in spots, but you will still have the same sturdy suede sole underneath. We believe soft soles not only feel good, but they are also good for you! Our feet are complex structures, with 19 bones and 126 muscles and ligaments. Podiatrists agree, the more time spent barefoot, the better for the development of a healthy and athletic foot. The soles on our shoes are soft and flexible with non-skid surfaces. Balance, strength and flexibility are maximized when feet are allowed to develop naturally. When you or your child can't go barefoot, a soft sole that mimics barefoot conditions is ideal. 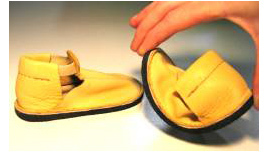 Soft soled shoes are critical for healthy feet. 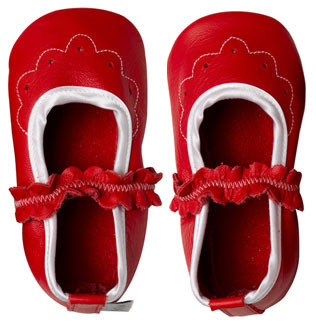 So whether you are looking for soft soled baby shoes for your precious little one's first steps or a health alternative to the common heavy, inflexible soles made for children or just a comfortable slipper for you to relax in after a long day, Soft Star Shoes has just the right sole for you! This discovery is exciting and important to the DS community for several reasons — one, it reinforces how important common vitamins are, which supports the use of TNI (Targeted Nutrition Intervention) — two, it reminds us of the connection between eye dysfunction and brain dysfunction so we will recognize and treat it as a symptom of a brain disorder in the central nervous system and not just as a sensory issue — three, it reminds us that brain receptors and cells can be protected from premature breakdown by antioxidants such as vitamin C and — four it offers us an additional way to treat GABA overexpression, which is a major problem in individuals with T21 (presently addressed with Ginkgo Biloba). My notes are in italics. I also bolded parts I felt are significant. Additionally, Vitamin C is great for increasing the level of glutathione in the body, which is much needed in individuals with DS. See studies below. Also this linked study shows that treatment with vitamin C can dissolve the toxic protein aggregates that build up in the brain in Alzheimer’s disease. In a surprising finding, vitamin C is found to prolong proper function of retinal cells. Nerve cells in the eye require vitamin C in order to function properly — a surprising discovery that may mean vitamin C is required elsewhere in the brain for its proper functioning, according to a study by scientists at Oregon Health & Science University recently published in the Journal of Neuroscience. The brain has special receptors, called GABA-type receptors, that help modulate the rapid communication between cells in the brain. GABA receptors in the brain act as an inhibitory “brake” on excitatory neurons in the brain. (These receptors do not work properly in people with Down syndrome.) The OHSU researchers found that these GABA-type receptors in the retinal cells stopped functioning properly when vitamin C was removed. Scientists and students in von Gerdorff's lab in OHSU's Vollum Institute are dedicated to basic neuroscience research. The vitamin C research work was done using goldfish retinas, which have the same overall biological structure as human retinas. The retina research work was done by Ph.D. student Evan Vickers, working as part of the von Gersdorff lab. The work was in collaboration with Cecilia Calero in the lab of Dr. Daniel J. Calvo from the University of Buenos Aires, Argentina, and Gustavo Cid and Luis Aguayo from the University of Concepcion, Chile. The work was funded by the Consejo Nacional de Investigaciones Científicas y Tecnicas (Argentina), the Pew Foundation, the International Brain Research Organization and the National Eye Institute of the National Institutes of Health. The study was published online in the June 29 issue of the Journal of Neuroscience, which is the official journal of the Society for Neuroscience. The Vollum Institute is dedicated to basic research focusing on gene regulation, structural biology, cell signaling, molecular neuroscience and synaptic modulation with implications for human diseases ranging from autism and other neurodevelopmental disorders to Parkinson's disease, multiple sclerosis, psychiatric diseases and mechanisms of drug addiction. How much vitamin C should our loved one get and in what form? A recommended dose of vitamin C is 250-2000 mg (not the US government's recommendation) for adults. So, just to give you an idea, 150 lbs = 250-2000 mg; 75 lbs = 125-1000 mg; 37 lbs = 62-500 mg; 19 lbs = 31-250 mg; 9 lbs = 15-125 mg, etc. Vitamin C is safe – too much simply causes diarrhea. Try increasing the amount until it causes loose stools, then reduce the dose slightly so it does not. This is called taking vitamin C to "bowel tolerance". Using muscle testing might be an easy and effective way to find out how much vitamin C your child can tolerate. Jett weighs 20.6 lbs and he takes 3,750 mg of vitamin C, twice a day. Your child may not need that much, or may need more! I figured out this dose by increasing it "to bowel tolerance." I slowly increased his dose until his stool became loose. Once this happened, I lowered the dose until he was regular and his stool consistency was normal. Bonus: Jett's constipation is gone! I started Jett on the Nature's Way Alive Vitamin C which I was happy with but he needed so much that it became too bulky. Once he's at least 60 lbs,I may try the liposomal vitamin C, to maximize my dollar. It's very strong stuff, so if you use it, use very little and slowly work your way up to the maximum dose. Even though Vitamin C is commonly supplemented, you'll still need to introduce it slowly and in small amounts. The initial doses of C may trigger an immune response in your child. (It can "kick-start" a sleeping immune system.) For Jett, he got a runny nose in the night. (I had to wake up and clean out his nose.) He'd never been sick and doesn't have runny noses, so this was significant for him. In other children I know who start on C, they actually got colds. Or at least the symptoms of a cold: runny nose, fever, etc. So, do ease your child into the dose. And pick a time when you don't have an upcoming recital or event where you'll need your child to be 100%. Also give him plenty of fluids throughout the day to help his body get rid of whatever the C has found to fight off. Update: At the same time that I had tried the C, I also was seeing if he could tolerate a little dairy. So when I stopped the dairy, and continued the C, the runny nose stopped. So, in Jett's case, it was the dairy and not the C.
Another possible side effect is gas. The Vitamin C will kill off yeast. This "die off" may cause gas. If your child still eats things that promote yeast like sugar, you may have more gas. Jett's diet is pretty clean and doesn't seem to have a problem with yeast, so he hasn't had this side effect. A teen that I know had terrible gas at first because he has a yeast-supporting diet. The most powerful and fast acting form of vitamin C is as ascorbic acid. If your child is sensitive to the acidity, you may want to purchase buffered C (Perque Potent C Guard is the only one not derived from corn) or by adding baking soda to your Vitamin C Powder from Vitacost or The Vitamin C Foundation Brand (which is not sourced from China). If it's still a problem, you can try a powdered fruit which is high in Vitamin C like Camu Camu or Amla. Jett uses camu camu because amla didn't muscle test well for Jett. Nature's Way Alive Vitamin C is easily absorbed, gentle on the stomach, non-GMO and free of common food allergens. It's just pure vitamin C complex from four 100% organic fruit sources: acerola, goji, amla (amalaki) and kiwi. You can get it in vegetarian capsules or in powder form. One capsule is 125 mg, when I started, I gave him a capsule a day and saw how that went for a week. I then was using Vitacost brand Buffered C Complex because Jett's need for vitamin C was greater than I realized and I had to give too many of the Nature's Way capsules (6) which was becoming too bulky for him to have to eat mixed in his food. Once he can take capsules, I would like to go back to find an organic source. So, now, Jett weighs 20.6 lbs and he takes 3,750 mg of vitamin C. I figured out this dose by increasing it "to bowel tolerance." I slowly increased his dose until his stool became loose. Once this happened, I lowered the dose until he was regular and his stool consistency was normal. The Vitamin C Foundation. The Ester C didn't work at all, by the way. At four years old, I'm just using camu camu powder over ascorbic acid for Jett, at one teaspoon twice a day, more only if there's any constipation. Originally, I was avoiding ascorbic acid because of the sour taste, but I read that, after long term use, it could break down into oxalates in the intestines which may lead to oxalate stones like kidney stones. The findings are debatable, see here for details. According to the makers of Lypo Spheric Liposomal Vitamin C, it provides maximum assimilation and bio-availability because there are no binders, fillers, gelatins, capsule materials, dyes, sweeteners or flavorings common with tablet and capsule supplements. Plus, if you take more than 2 to 3 grams of traditional Vitamin C, the ascorbic acid in the intestines can cause gastric distress -- gas, cramps, and diarrhea. Often Vitamin C will be eliminated via very loose stool. By using this brand, you can supposedly avoid the degradation and discomfort associated with traditional forms of Vitamin C and protect the lower G.I. Tract - hence, no gastric upset, no diarrheal flushing effect. Lastly, the liposomes quickly journey to the bloodstream and are circulated throughout the body and "grabbed" by the damaged cells that need it. You will need to observe your child and go very slowly, especially if using the powerful Liposomal Vitamin C.
Since it's a water soluble vitamin, there isn't a high level of risk associated with an overdose. The excess amount that your body does not needs gets excreted out through urine so it does not cause much of a problem. However, that does not mean that you should continue with high C foods or supplements in excess if overdose symptoms appear. Someone who has taken too much vitamin C may have a strong smell during urination, bloating or gas, nausea and an upset stomach. He might also experience sores on the inside of his mouth. Diarrhea could also occur. It was once believed to cause kidney stones, but experts now say there is no solid evidence of dangerous side effects from vitamin C.
In a more severe case of overdose, you might notice the following symptoms: a greater need for oxygen and deficiencies in B vitamins as well as copper. These symptoms usually only show up in more severe cases in which at least 6,000 mg of vitamin C has been consumed, or when someone takes a large amount of vitamin C and other vitamins or minerals. If you see any of these symptoms and believe that the cause may be a severe overconsumption of vitamin C, simply reduce the intake of vitamin C.